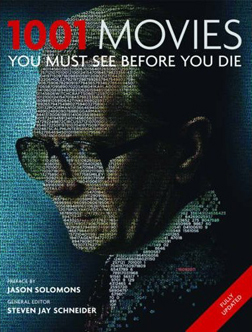 Monday sees the release of the next edition of the 1001 Movies You Must See Before You Die book, which sees my recently reviewed Tinker Tailor Soldier Spy on the cover. This release got me thinking, what films would I most like to be added in this edition? As usual, my first instinct regarded efficiency and time-saving, so of course the films I’d post want to be added would be ones that I’d already reviewed, so I wouldn’t have to review them again. But then I thought no, that’s not really what I want. I want to watch new films, experience new things and write about them, that’s why I’m writing a blog in the first place; to discuss movies. Why would I want an excuse to do that less? So as well as my already-reviewed list there’s another for films that not only have I not reviewed, but that I haven’t even seen, and I think should probably be on the List. Thirdly, because it’s a super-bumper-bonus day, there’s a final top 5 for the films that haven’t appeared on either list, but will most likely be on the actual list, for which I haven’t been consulted. What films do you all think will be on there?